1. The ‘up’ side of joconde layers when they finished baking should remain their ‘up’ side as they are more porous and will more easily absorb the syrup. 2. Melt little chocolate in a microwave for 30 secs on high. Keep repeating spurts of 10 secs till it is melted. Allow it to cool down using tempering. 3. Move a layer (which will form the bottom layer) of joconde on a separate parchment by flipping over. Apply a thin layer of this melted chocolate on it. Allow it to firm up for few minutes, then place it in the refrigerator for another few minutes. This will make sure that the cake doesn’t stick to the platter when sliced & served apart from adding chocolatey deliciousness. 4. Flip it back (chocolate side down) on to the platter or cake board to start assembling. Gently peel the parchment back, you may re-position the layer to center it. And we are good to go! 5. Apply coffee syrup thoroughly soaking it. 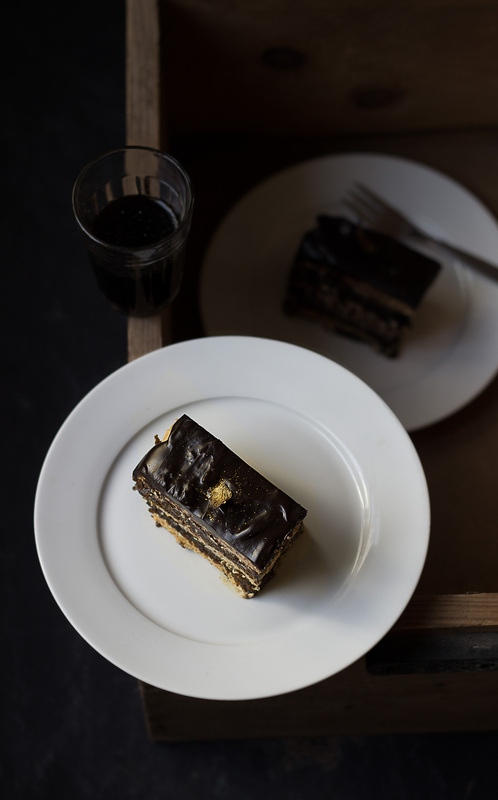 This gives the melt-in-the-mouth texture that Opera cakes in Paris are known for. Layers should be soaked till they are brown all the way through. 6. Spread buttercream on top of the soaked layer. Apply evenly & slowly from side to side about 1/4″ thick. Place your next layer, making sure that ‘up’ side of baking is ‘up’ side for soaking. Soak it as in earlier step. 7. Now spread a layer of thin ganache. It should be spread thinner than buttercream. I warmed it slightly to get a thin layer. Place the next layer of the cake. Soak it. Spread buttercream. Place the next layer of the cake. Soak it. Spread thin layer of ganache. Place the top layer. If there are any high spots, you can press them down gently with your palm. Soak it in coffee syrup. 8. Now apply a thin layer of buttercream similar to a crumb coat to allow even application of chocolate layer. Apply ready ganache/ tempered chocolate. Spread evenly & quickly. It is ok if it drizzle down a bit on the sides. Again I used slightly warm ganache to cover the top layer. You can use tempered chocolate as used traditionally. 10. It is best to slice the cake into servings at this time to avoid breakdown of the cake later. Again using knife dipped in hot water & then dried, slice the cake into any size serving you like. Do not separate the slices, and place your cake in refrigerator. It is best to cover the cake in a cardboard box before placing in refrigerator to avoid cake sweating. 11. Refrigerate for 1-2 days. Before serving remove the cake an hour before serving. Separate the already sliced pieces using a warm knife dipped in hot water & then dried. Serve slightly cold.